Anyone that has been enjoying online slots for a number of years will have no doubt heard of Jackpot 6000. An online slot by NetEnt that has proved to be one of the game developers in the iGaming industry. 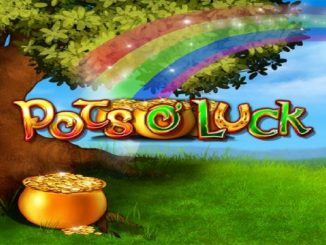 In this Jackpot 6000 slot review, you will learn everything you need to know about this enjoyable online slot and why we feel you should at least try it out once. As a classic slot that has 3-reels and 5-paylines, you are getting a slot that is not only easy to play but is also highly lucrative. Sometimes players want an online slot that does not contain overly-confusing features and would rather just have a slot where they can spin the reels and hope for some impressive payouts without having to think too much. This is exactly what you are getting with Jackpot 6000. 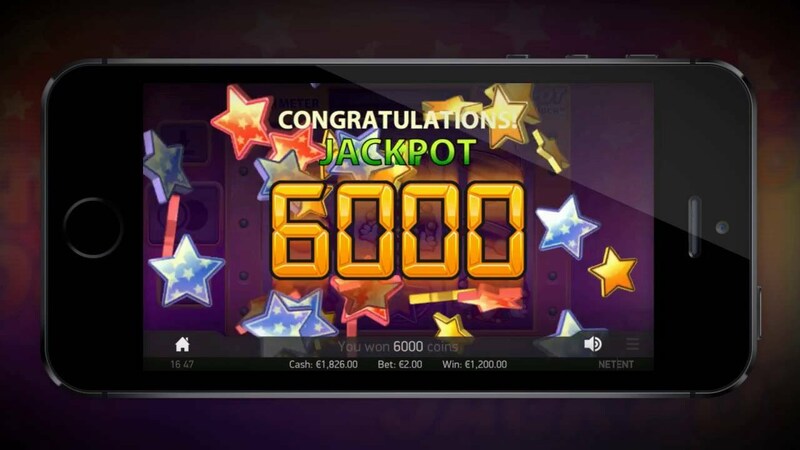 While NetEnt is known for producing slots with tons of features that contain fantastic graphics and animations, they are also known to cater to fans of traditional slots and have done exactly that with Jackpot 6000. They have kept things simple without letting it become boring and through the excellent main feature (which you will learn about later), there really is the potential to walk away with some healthy profits. Can Mobile Players Enjoy Jackpot 6000? Where to Play Jackpot 6000? You have to hand it to NetEnt as they have been around so long yet they are still able to come up with unique online slots that are always enjoyable to play. In fact, they are the second oldest software developers behind Microgaming having entered the online gambling industry way back in 1998. Fast approaching their 20th birthday, NetEnt is widely renowned for creating unique slots games that always have some very unique features. There are many players out there that swear by this team of developers and some will often refuse to play online slots from anyone else such is their loyalty to this excellent casino games developer. Whenever we hear about NetEnt releasing a new online slot, we are always expecting it to be excellent due to most of their previous releases being just that. Whether you like classic slots, progressive slots, slots that have tons of unique and enjoyable features or slots themed around your favourite movies, you can bet that NetEnt will have something for you to enjoy. 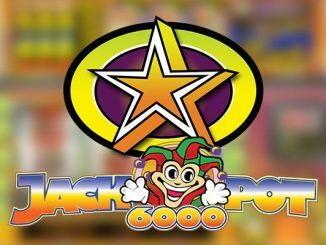 There is not really a theme as such with Jackpot 6000 as it is essentially designed to be like a slot machine that you would find in a land-based casino. The advantage that this online slot has over those land-based games you will find in casinos is that you have a much higher RTP and the casino has a lower edge. This is basically because land-based casinos have more overheads and thus need more money going through them compared to online casinos. The return-to-player percentage on Jackpot 6000 actually changes depending on how many coins you use. We recommend betting with the full set of 10 coins as you will have between 95.10% and a stunning 98.90% RTP. Betting with fewer coins will only give you an RTP of between 74% and 79% which is a significant difference. As for the betting range on Jackpot 6000, players are able to bet anything between $0.01 and $20.00 per spin. This can be altered by changing the coin values and how many coins you would like to bet on each line. The coin values can be set to anything between 0.01 and $2.00, so betting the maximum amount through the maximum ten coins is where the max bet of $20.00 is established. As the name of the game might suggest, the jackpot achievable is a total of 6,000 coins which equates to a cash jackpot of $12,000 if you have bet the maximum. This payout can be achieved when you land the Joker symbol on your reels on an active pay line. On the reels you have a bunch of symbols you would expect on a classic fruit machine style slot. There are cherries, lemons, grapes, bells, gold stars and that joker symbol that could land you the jackpot. The backdrop to the game is that of a land-based casino and you can see various other slots in the background. Graphically the game looks good and the animations are pretty flawless as the reels spin. Admittedly, it might not have the high-quality graphics that some other modern slots might have but they are more than good enough. On the machine, you have the reels and above them is the games pay table that will show you what winning combinations you can land and what your award will be for doing so. You will notice that the joker symbol is the highest paying symbol and that it can also win your random rewards should you participate in the super meter mode. The Joker symbol in Jackpot 6000 actually acts as a wild symbol in the base game which improves your chances of picking up wins. As a wild symbol, this joker can substitute for all other symbols on the reels if a winning combination can be made by doing so. During the enjoyable Supermeter mode, however, the joker is no longer a wild symbol but it can bring some excellent wins should you land two of them on your reels. 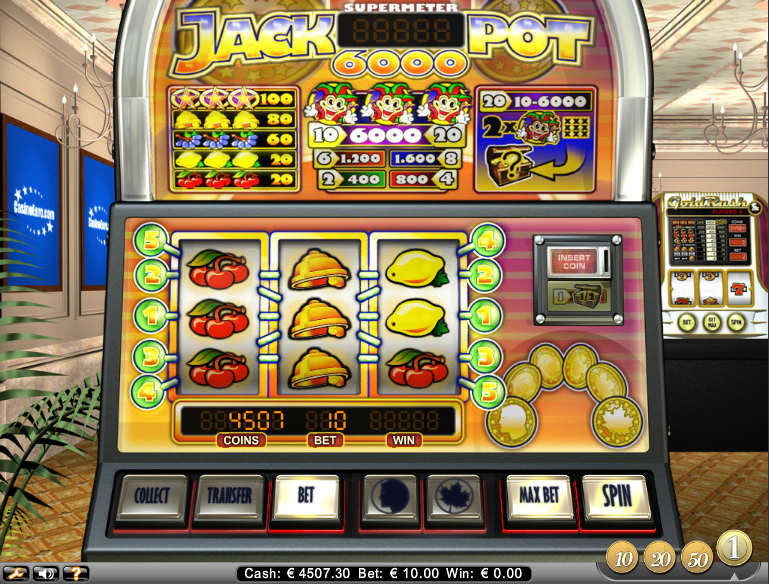 Where Jackpot 6000 really stands out is through its main game feature which is the Supermeter mode. Each time you record a win you are given an option of transferring your winnings to the super meter which is located at the top of the reels. You do not have to transfer your winnings and can instead choose to collect them. However, in the super meter mode, you stand the chance to win increased payouts. A loud siren rings out whenever you hit a win and it is at this point where you are given an option of what you want to do with these winnings. You essentially have three options, collect them, transfer them to your super meter or try to double them up through the gamble feature on the game. It is in this mode where five paylines are used rather than just the one that is used in the base game. This gives you the potential to win multiple times per spin should you land winning combinations across the pay lines on your reels. 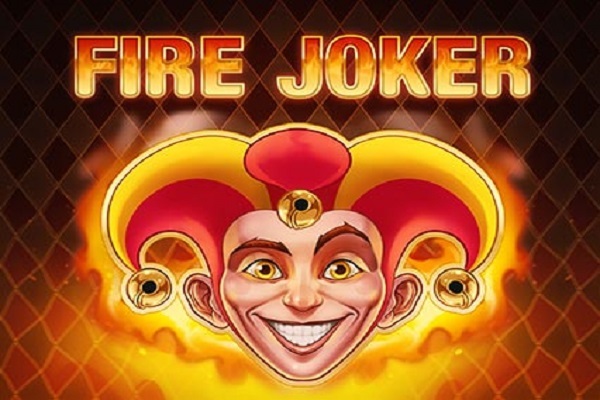 The real handsome payouts in this mode can be won when you land two jokers on an active pay line as you will be given a random payout of 10 and 6000 coins each time. This mode is really what makes this slot as enjoyable as it is as without it there is not much else there. NetEnt always likes to add something unique to their slots and in Jackpot 6000 it is definitely this wonderful game mode. Gambling your winnings is another option you have which can further increase what you have already won before transferring to the super meter mode or collecting. If you choose to try and increase your winnings you are essentially tasked with playing a coin flip game. You can choose heads or tails and should you guess correctly you will double your money while guessing wrong will see you lose your original winnings. If you manage to successfully double up your winnings you can move it to your super meter fund and have more to play with or simply collect double what you would have originally had. This depends on the online casino that you are playing Jackpot 6000 and whether they have mobile-optimised their online casinos. The game itself can certainly be played on mobile devices whether through a browser or via an app but like we say if you are unable to access the online casino, you will not be able to play the game. Mobile-optimisation is very important for game developers and casino developers alike these days as the mobile players make up a very large percentage of the gamblers at the online casinos. If a slot or casino is not compatible enough for mobile players on Android and iOS to be able to play, they are just going to go to an online casino that is. 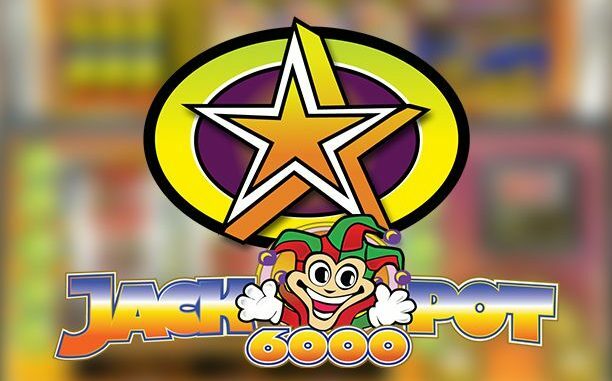 If you have liked what you have heard about Jackpot 6000 so far and are keen to try it out. You can play for free or for real cash at a number of popular online casinos. We suggest Leo vegas since this is a top rated online casino and the number one mobile casino too. Even if Jackpot 6000 is not your cup of tea, you will find plenty of other excellent online slots at those casinos that might just be the type that you prefer. 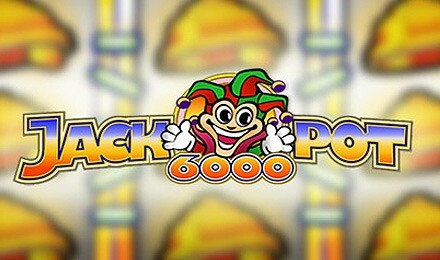 Jackpot 6000 is a classic slot and one that has been hugely popular since its release in 2013 but if you like more paylines, more features or slots with things like a progressive jackpot, you will be able to find a good selection of them. Jackpot 6000 was obviously designed for the type of player that is not too interested in a lot of game features. There are plenty of people out there that would much rather play a classic slot like Jackpot 6000 and the game’s success shows this. 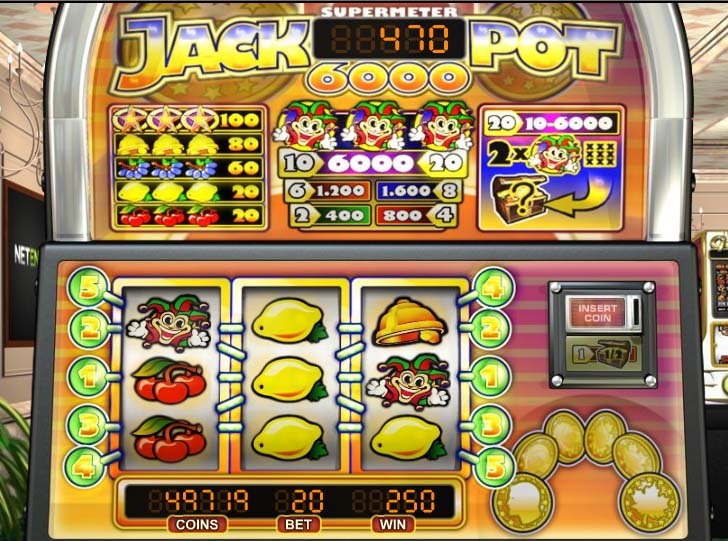 Jackpot 6000 was released back in 2013 and the fact that it is still doing so well and is still a popular game despite all the new modern slot games being developed, certainly shows that this game is one of the best classic slots around. We also like how NetEnt has once again been unique with the super meter feature they have included in the game. 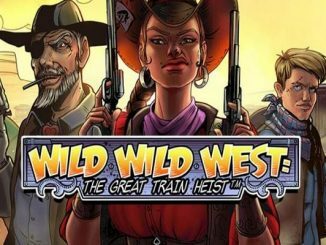 It really does add an extra layer of entertainment and it is not only much more lucrative than the base game but you could see an RTP of up to 98.90%. That means that the casino only has a house edge of 1.10% when you are spinning away, something that you very rarely see on many other online slots. The type of players that will prefer Jackpot 6000 are those that have smaller bankrolls because, with a max bet of $20, high rollers might not be too interested. While that is true in most cases, we do know that a lot of high rollers do play Jackpot 6000 and that is because of the lucrative super meter mode that carries a lot more bang for the buck with the RTP of the game. We have always been big fans of NetEnt as they really do release some of the highest-quality online slots around. They are masters at all types as well, as they can release the modern slots with so many paylines, progressive jackpots and game features but they are also more than adept at producing simple yet classic slots such as this one. All in all, we feel that Jackpot 6000 is about as good a classic slot as you will find and one that really does have so good payouts available to win. Graphically it is more than adequate and the gameplay it offers is right up there with any of the top classic slots around. In fact, with that excellent main feature, we would argue that its better than anything else in regards to gameplay. If you do decide to play Jackpot 6000 after reading our review, please remember our tip of always betting the maximum ten coins. You get a lot more value due to the higher RTP that a full amount of coins will bring. If you are struggling to afford it, just lower the coin values rather than reducing the number of coins. Hopefully, you have enjoyed our Jackpot 600 slot review and have learned what you wanted to know about this excellent slot. It comes with our recommendation for sure and we suggest you give it a try the next time you want to enjoy some online slots at your favourite online casino.